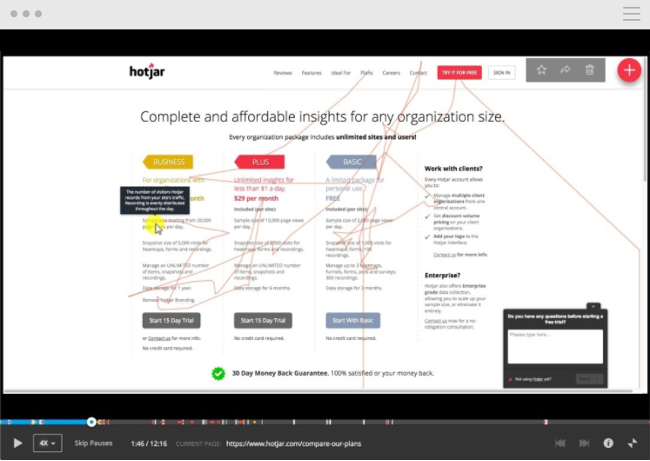 Hotjar has the ability to show you how your online users are really experiencing your website through various feedback collection methods. Users can visualise visitor behaviour using the click, cursor movement and scroll heatmaps. On the other hand, users can also collect visitor recordings (by tracking sessions on the page) and carry out feedback polls, or send out surveys and forms to receive feedback directly from the website visitors. Polls and surveys can be triggered within conversion funnels, when the visitor wants to abandon the page, after an x amount of time or when the visitor has scrolled halfway down the webpage. So what’s the alternative? Visual feedback is a risk-free solution in that the initiative to provide the user with data lies with the visitor. This is also a much more trusted approach as it doesn’t involve the company having to ‘peak over the shoulder’ of the visitor while they are browsing the website. Of course, we’ll let you decide what’s best for your business. Mopinion is a user feedback software that collects and analyses both website and mobile user feedback (via a mobile SDK) in real-time. Users can build, design and configure feedback forms however they like. They can also target specific groups of online visitors with feedback forms and gain insights into why they are struggling to convert. This is done using advanced triggers that are set off based on digital visitor behaviour. Users can deploy forms either in modal, slide-in or embedded on the page. Upon collection, feedback items can be visualised in customisable dashboards and charts for advanced analyses. Additionally, digital teams can share and take action on these feedback items in a timely manner with the help of smart alerts. MouseFlow is a tool that is actually very similar to Hotjar, albeit it’s been around much longer than Hotjar. 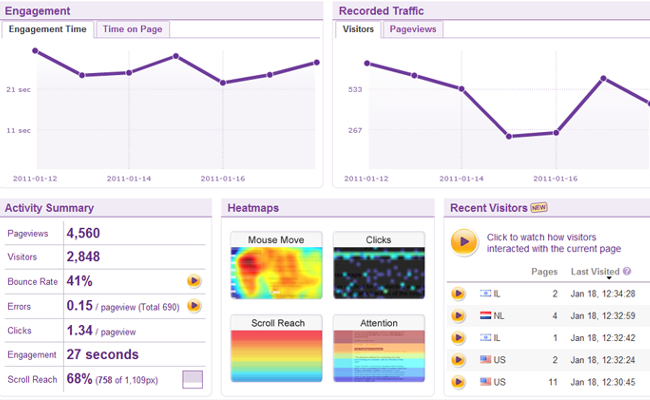 With MouseFlow you can visualise website visitor behaviour using the click, scroll, movement and attention heatmaps. User activities can also be recorded. One of the greatest advantages of this tool is that it has a form analytics feature which allows you to see and understand why website visitors are abandoning your forms. It is also possible to track different funnels and see how visitors from various traffic sources behave on your website. Unfortunately, however, Mouseflow does not offer anything in terms of surveying or polling visitors. Freshmarketer, a product of Freshworks (which previously acquired Zarget) is an online feedback tool that helps you to analyse and understand the user experience of your websites. Freshmarketer offers A/B testing, heatmaps, session replay, split URL testing, funnel analysis, form analytics and polls & feedback. Using polls and surveys, users can prompt visitors to provide feedback whenever an important event occurs on the website. You get five built-in polls and feedback sessions. You can view this feedback in the form of word clouds for text analysis purposes. Kampyle, part of Medallia, is an online feedback tool that enables you to quickly create feedback forms. With the forms, users can trace what their website visitors are experiencing across different parts of the website. In addition, it is possible to trigger feedback forms for a certain amount of visitors or if a visitor shows exit intent (e.g. clicking away from a page). This tool, however, offers limited scope for analysing and reporting on the feedback data assembled. Feedbackify is an easy-to-setup online feedback tool for your website. 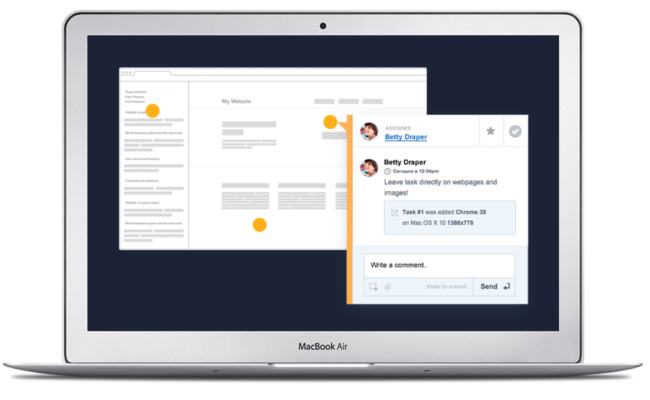 With Feedbackify, you can create feedback forms with a drag-and-drop editor. Website visitors can leave ratings and comments, including compliments and suggestions. A real-time dashboard can be used to see and analyse all received feedback. Unfortunately, however, this tool doesn’t offer advanced reporting or text analysis capabilities, but if you’re going for cheap and simple this is a great tool for you. Similar to Hotjar, Crazy Egg offers multiple types of heatmaps that shed some light on visitor behaviour, include where they click, how far they scroll, what they’re looking at on any give page, etc. Additionally, users can view traffic segments and how the behaviour of these segments differ from one another. This growth hacking tool is also very easy to implement. Keep in mind, however, that CrazyEgg is a fairly expensive alternative and users are required to pay on an annual basis rather than monthly. 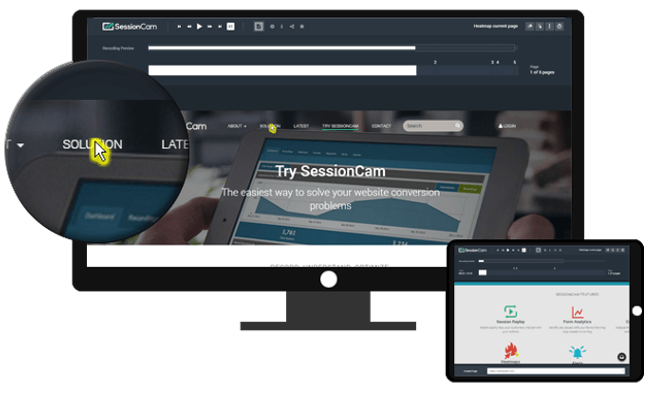 SessionCam is a tool that enables users to watch recordings of live customer sessions. This tool’s real-time API feed can be used to basket abandonment campaigns or pass on customer data to other parts of your business. To save time SessionCam uses an advanced algorithm to detect struggle and from that algorithm it creates a Customer Struggle Score for each recording. 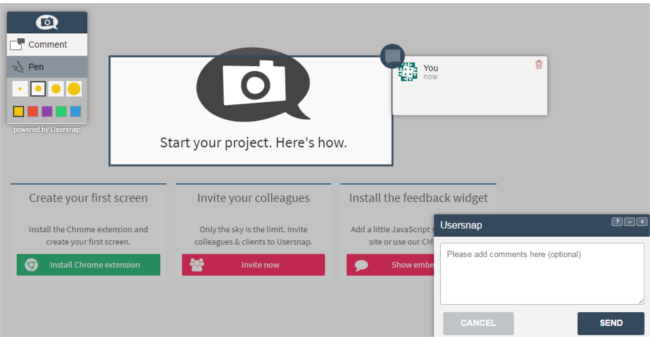 TrackDuck is a visual feedback tool geared heavily towards web designers and developers. Using this online feedback tool, elements of a webpage can be highlighted and commented on. The feedback is sent in real-time to your email and can also be displayed in the dashboard. It is also possible to chat with other users, assign tasks and check the progress/status of particular issues in the protected environment. ClickTale is an enterprise, cloud-based analytics system that collects visitor recordings from mobile or desktop sessions. Users can filter session replays by user environment, demographics, mouse movements, traffic sources, in-page behaviour and more. The client has control of which pages and text input is recorded. This tool also offers heatmapping, conversion funnels and form analytics. I hope this article helps you to find a good alternative to Hotjar, whether you choose the visual feedback or visitor recording route. Keep it mind. Sometimes it can be very difficult to find or to choose (alternative) tools that suit your wishes. This is mainly because there are so many different tools out there to choose from. In fact, it can be seemingly overwhelming process. Our advice? Just focus on the various techniques they offer for collecting, reporting or analysing online user feedback from your websites or mobile apps and go from there!